SACRAMENTO, California — The Sacramento Kings’ video tribute lasted just shy of a minute on Thursday night. Every second, however, meant the world to former Kings center DeMarcus Cousins, who waved to the crowd then touched his heart to show his appreciation. Cousins’ 6½ seasons with the Kings had their ups and downs, with no playoff appearances. But this night was about remembering the good times as the three-time NBA All-Star returned to Sacramento for the first time since the Kings traded him to the New Orleans Pelicans last season. When Cousins’ name was called during pregame introductions, the fans showed respect with a loud and long ovation. 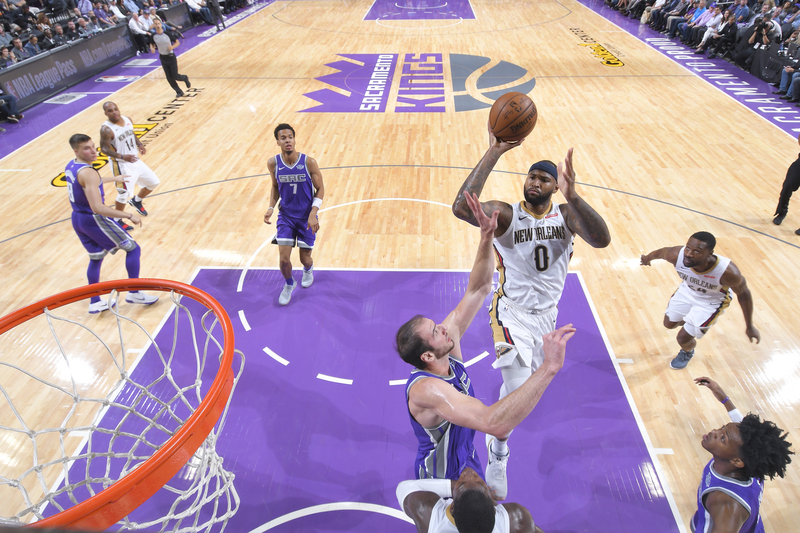 Cousins starred in memorable fashion in his return, scoring 41 points, grabbing 23 rebounds, dishing six assists and nailing three 3-pointers in the Pelicans’ 114-106 comeback win over the Kings at the Golden 1 Center. The eighth-year NBA big man acknowledged that his first career 40-20 game was perhaps the greatest performance of his career and he was glad it was over. The one thing that stood out for Cousins was not his scoring line, but the thanks he received from fans. 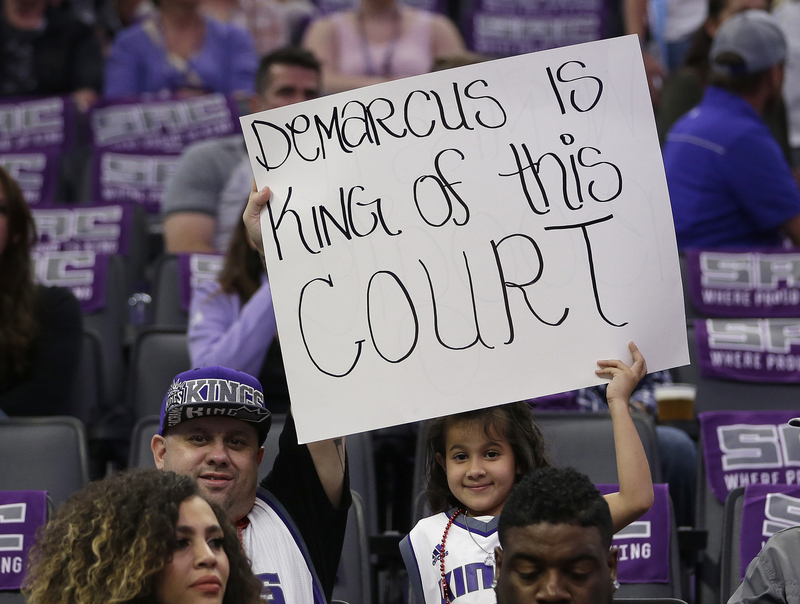 Sacramento Kings fans Aubrianna Andersen, 7, and her father, Kenny, show their support for former Kings player DeMarcus Cousins. Emotions are always running strong when NBA stars return to play a former team for the first time. The Kings and their fans showered Cousins with love that he will never forget. This isn’t always the case. Teams cannot control how the fans respond to the return of a former star, but they can control the decision to play a video tribute. The Oklahoma City Thunder declined to give their 2014 NBA MVP Kevin Durant a video tribute in his return last season after he left for the rival Golden State Warriors in free agency. The Thunder were in a tough spot as sources said they were nervous that their remaining star Russell Westbrook would be peeved if Durant got a video tribute. The Cleveland Cavaliers didn’t play a video for guard Kyrie Irving when he returned with the Boston Celtics in the 2017 season-opener. Irving, who wanted to be traded, was a key member of Cleveland’s 2016 NBA championship and was considered their top player next to LeBron James. When then-New York Knicks forward Carmelo Anthony returned to play his old Denver Nuggets for the first time in 2013, he was booed strongly during pregame introductions, and the video tribute shared shout-outs to ex-Nuggets Marcus Camby, Kenyon Martin and J.R. Smith. Expect Durant, Irving and Anthony to make the Naismith Memorial Basketball Hall of Fame when they retire. There could come a time when the Thunder, Cavaliers and Nuggets want to retire their jerseys. But these stars could be hesitant about wanting to be celebrated in the future by teams that didn’t show them respect upon their return. Pelicans guard Tony Allen received a video tribute when returning to Memphis, Tennessee, for the first time this season. “The Grindfather” of the Grizzlies’ renowned “Grit and Grind” style also was told the franchise will retire his No. 9 jersey after he retires. Allen also won a 2008 NBA championship with the Celtics and played for the franchise from 2004-10. Allen said it’s “disrespect and pettiness” for a team to not have a video for a former star. Allen’s old Celtics often have a mentality best said by their vice president of media services/alumni relations, Jeff Twiss: “Once a Celtic, always a Celtic.” Twiss has been known to give tickets to players who might have just had a cup of coffee with Boston. Ex-Celtics guard Ray Allen departed from the franchise on poor terms after leaving money on the table to sign to play with LeBron James, Dwyane Wade, Chris Bosh and the rival Miami Heat in 2012. While Paul Pierce has forgiven Ray Allen publicly, ex-Celtics star Kevin Garnett is still believed to have a problem with Allen’s abrupt departure. As for the Celtics, they had a video tribute to Ray Allen when he returned to Boston for the first time, which ended with “Thanks for the memories, Ray.” It lasted less than a minute, but he seemed appreciative. Time will tell if he reunites with his old teammates when the Celtics celebrate the 10-year anniversary of their championship next year. But the Celtics didn’t hurt themselves with their red-carpet treatment of Allen upon his return. It’s not uncommon to see former Celtics greats such as Hall of Famers Bill Russell, John Havlicek, Tommy Heinsohn and Bob Cousy at practice or games. Once a Celtic, always a Celtic. Rondo said he almost teared up when he received a video tribute when he returned to play in Boston for the first time as a member of the Dallas Mavericks during the 2014-15 season. The four-time NBA All-Star was the starting point guard on Boston’s 2008 NBA championship team. “They are a classy organization,” said Rondo, now with the Pelicans. I saw it when [Paul Pierce] came back for the first time and Kevin [Garnett] as well. I hoped I would be in that category as far as welcoming me back, and they did. It’s something I always remember. Former Kings forward Chris Webber’s No. 4 jersey hangs in the rafters of the Kings’ arena. During a first-quarter timeout, the Kings also ran a video tribute for the Turner Sports NBA analyst who was working the game. Tony Allen, 35, is in his 14th season in the NBA. When his playing days are done, expect him to take the Grizzlies’ calls if they ever need anything. “Leaving a place, you always have thoughts about how they feel about you,” Allen said. “You always wonder if you could’ve done something to stay. But, to come back and see they appreciated you, they have love for you, they’re showing love for you, it kind of makes you get a little emotional. For me, I had butterflies in my stomach. When I found out about the jersey retirement, it did put me in tears. I couldn’t gather the fact that they were showing me that much love. Coming back, you really want to win. You really want to beat the team. But it’s an emotional statement. You never forget that.